Private Activity Bonds can be good investments, offering tax advantages. But, just like with other bond investments, there is a panoply of risks to be analyzed before making a purchase. Private Activity Bonds [PABs] are bonds sponsored by an issuer of municipal bonds on behalf of a private entity. The private entity is the party obligated to pay on the bonds, not the municipality. There are strict tests in section 141 of the Internal Revenue Code that prevent the borrowing from being considered that of the municipality, which in broad says that if the private benefits are not minimal, the interest income is taxable. But there is an exception to this rule if the proceeds of the issue are applied to qualified private activities, meaning there is a significant public interest being served. For more details on what those public interests are, see page 5 of IRS publication 4078. The grand majority of PABs are issued for qualified private activities; few are fully taxable. However, interest from PABs is subject to the alternative minimum tax, aside from bonds issued for 501(c)(3) projects and certain housing projects. The private entities benefit if the projects are successful. 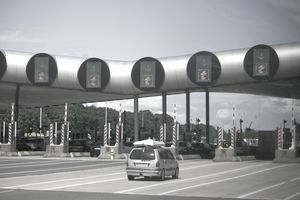 In some cases, a private company may comply with the requirements of a state agency to expand infrastructure, but the company will profit from the business generated. An example would be American Water Works (look at note 7) where they have worked with the New Jersey Environmental Infrastructure Financing Program to expand water infrastructure post-Superstorm Sandy (note references to New Jersey American Water, a subsidiary of American Water Works). The public benefits from increased infrastructure spending. In an era of tight municipal budgets, more infrastructure projects get done when private interests benefit to a degree. The lenders who buy the PABs benefit from the interest paid, excludable from gross income, but subject to the AMT. You can get an additional 0.25 percent-0.50 percent/year of additional income versus a similarly rated municipal bond. A toll road bond fails because tolls are too high and drivers don’t take the toll road. An airport constructed or expanded does not thrive. A nonprofit power plant is not competitive versus for-profit competitors. A public rail system does not get enough passengers. When you analyze a PAB ask the hard questions. It is not certain that “If you build it, they will come.” If it is not meeting a compelling need at a reasonable price, it would be prudent to avoid the bonds. Review the bond ratings, but read closely the assumptions in the bond rating write-ups. They highlight the main risks––ask yourself how likely it is that the risks they posit will not happen. The second thing to think about is the length of the bonds, which range from 10-50 years. Infrastructure projects are long duration, and they need long financing as a result. Can you afford to lock up money for that long? If so, you would likely be better off investing in stocks, or a private business, where you can get some growth. Inflation may not be a risk today, but if you lock in a fixed rate on a bond for 30 years, and the bond is not that liquid, how happy will you be if inflation rises, and you have an unrealized capital loss? PABs are fungible, not liquid. They can be sold, but if you need money quickly, you will have to take a haircut versus where an un-coerced buyer and seller might trade the bonds. Many PABs have call features that allow the bonds to be redeemed early. When interest rates fall, bonds can be called, giving you back your money to invest in a lower interest rate environment. Many PABs are complex, having multiple classes of bonds issued, various covenants, limited credit support from the municipal sponsor, reserve funds, etc. The structural support may look good, but is it really good enough? The rating agencies will give you their generally good opinion, but that is no guarantee. Finally there is tax risk. AMT treatment for PABs has changed over time. It’s unlikely, but not impossible that if the federal government needed to raise taxes, that municipal bonds could be made taxable, including PABs. After all, municipal bonds are owned primarily by wealthy people and institutions, and would the government tax them in a crisis? It will depend on the politics at the time. Who Should Buy PABs or Municipal Bond Mutual Funds That Own PABs? First, consult your tax accountant. Find out how much room you have to take on AMT-taxable bonds without triggering the AMT. If you are doing it yourself, read the prospectus to understand what the taxation status of the PAB is––it is prominently mentioned. Compare the after-tax yield to other bonds of similar maturities, liquidity, call features, and credit risk. Are you getting a better deal? With municipal bond mutual funds, there are none that specialize in PABs. Often a fund will have a trivial amount of PABs at maximum, and it is usually not enough to make a difference in buying the fund or not. At tax time, there may be some small numbers going into the AMT calculation from the few PABs they hold. There is a recent paper written by the Congressional Research Service that is very comprehensive on PABs. For more on the taxation of bond interest, there is a good article here. As with all investing, let the buyer beware. Complexity usually favors the experts, so if you buy individual PABs make sure that you have done adequate analysis.